Well all the stuff arrived in one piece, if not totally unscathed. Nearly everything had a scrape or a dent of some sort. Still I can repair or hide most of it! I do have to say though my Index furniture looks a tad out of place in an Issan village hut, ha ha ha. 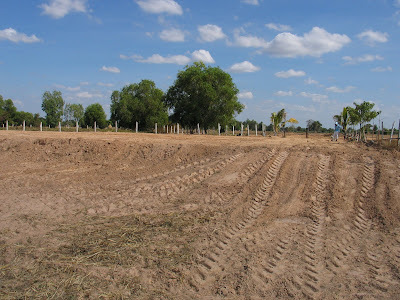 This is the piece of land on which I will be having 'Che Wilson' constructed. Its about 1 rai (1600 sq mtr's) This is plenty of space for the house to sit and still have ample room for a vast veggie plot. It offers commanding views of beautiful countryside and rolling rice fields. Perfect for picking off the odd peasant or unsuspecting water buffalo. I decided to only fill two thirds of the land as I thought a flat plain would be a bit boring, so now it has two levels. One no doubt to flood nicely in the rainy season!! Whats the cost of all the labour I hear you cry? 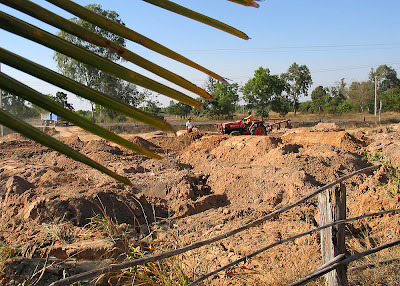 Well for the tractors, earth movers, levelers and diggy things, the complete total for was 30,000 baht or approx £440. 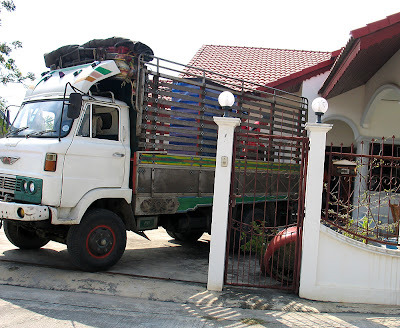 It worked out at 200 trucks of earth at 150 baht a truck or approx £2.23. Where could you get it any cheaper? Now it has to be left for about 6 months to settle, before building can begin. I intend to have built, an abode of about 180 sqm's. Consisting of 3x bedrooms, 2 x bathrooms, but still have plenty of time to make adjustments as it suits me. 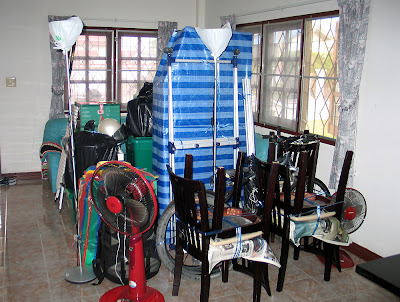 Today is the day of the big move up north, and we have been up since 07:00 doing the final packing. 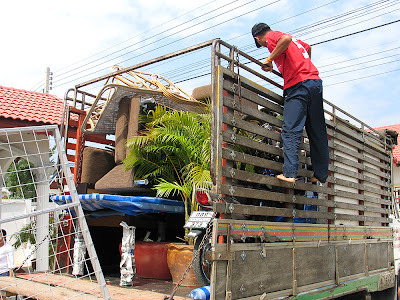 Most of the furniture has been swathed in blue and white sheeting, (well worth it at about 750 baht for 30 metres). To minimise rubbing on the journey. We also purchased several large plastic tubs to hold the breakables. Its in the hands of the lord Buddha now? Suddenly at 11:30 the usual quite of our home was punctuated by the rumble of a large truck, followed by the 'toot-toot' of a horn. The beast had arrived. I run outside and slid open the gate to allow its entrance. It looked colourful enough, but was it up to the task? Great plumes of smoke pumped from its exhaust as it reversed to a stop and breathed its last. All at once four fit looking Thai guys sprung into life, emerging from within canvas sheets, where they no doubt have been slumbering before the task ahead. 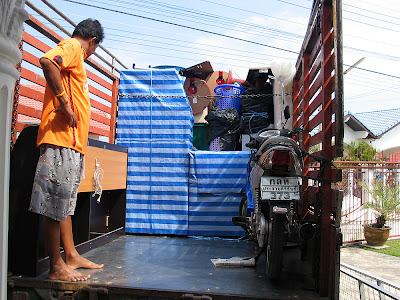 Our driver had been around two days earlier, and assured us that his truck was large enough to accommodate all our belongings. We shall see as I glanced around me dubiously. Less than half our stuff was loaded and our man looked thoughtful as to whether it will all go on? I had already started to select stuff to leave behind as a last resort. Every now and again he would point to something and say 'this go' when we replied yes, he would scratch his head and let out a desperate gasp. 'should have got a bigger truck' I mumble under my breath. Now it was straining at the gunnel's, and we still had the patio furniture to go on, no way, I thought to myself it ain't all going to fit on, no way. However our optimistic driver kept barking out orders, and things would get shifted around, or rather shunted. I grimaced as the sound of wood on metal could be heard, followed by the ominous twang of something from deep within the pile! Thus legend was born, it was all on. I gave the crew around of applause and smiled at the driver through misty eyes. They in turn eyed me with amusement. I say it was all on, but I lied. All but one item could be transported to the new promise land I had spoke about for so long. 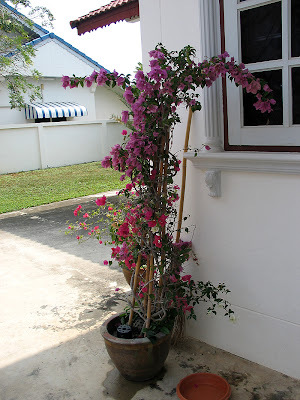 Sadly I had to take one of my plants to one side (pictured above) and break the news that it would have to be left behind, perhaps to fall on its own bamboo pole, who knows. Jeremy appeared to take it well, but I could sense a great hurt from deep within his foilage. Then there was a great whooping and a hollering, canvas sheeting was wrapped around everything and they were off, amid more plumes of smoke. What condition will it arrive I thought to myself? What condition indeed.